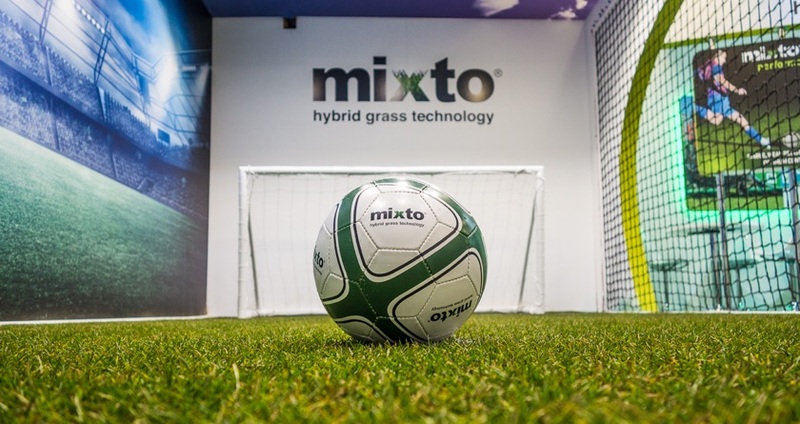 Visitors to this year’s SALTEX exhibition will have a unique opportunity to get their feet on the Mixto hybrid turf system. idverde, the UK’s exclusive supplier and installer of Mixto, is excited to bring the innovative sports surface to the exhibition, with a stand featuring a mini Mixto football pitch so that visitors can try it out for themselves. Mixto is a reinforced natural hybrid surface, consisting of a synthetic and a natural grass component. The added strength from the artificial turf improves the durability of the pitch, with playing time increased to around three times that of natural turf, and with no noticeable change in surface performance to players. The Mixto hybrid turf system has recently been installed at Peterborough United FC (“The Posh”), where it has received excellent feedback from the grounds team for its quality and durability. The hybrid sports surface has also been chosen by some of the biggest and best international clubs, including Real Madrid and A.C. Milan, as well as 2018 World Cup semi-final venue, Zenit Arena in St Petersburg. “We’re delighted to be bringing Mixto to SALTEX 2018. The show offers an unmissable opportunity for pitch care professionals to come and try Mixto for themselves and see the benefits that this versatile and durable sports surface can offer. SALTEX 2018 takes place at the NEC, Birmingham on 31 October and 01 November 2018. Find idverde and Mixto in the outdoor demo area (plots 1 and 3) and with Rigby Taylor on stand G060.